The Avaya 1403 digital phone is the entry level model in the budget 1400 series. It’s economical and perfect for staff and locations that only need a basic handset or make very few calls. For a full overview of the Avaya 1403 phone please read below. The Avaya 1403 phone handset is the standard or basic model in the new budget Avaya 1400 series line up. It's incredibly affordable and is a great addition for people not needing more advanced functionality required for daily use. The Avaya 1403 phone is perfect for kitchens, waiting rooms, temporary desks, retail showrooms and for staff that really only use the phone for making/ receiving the occasional call. 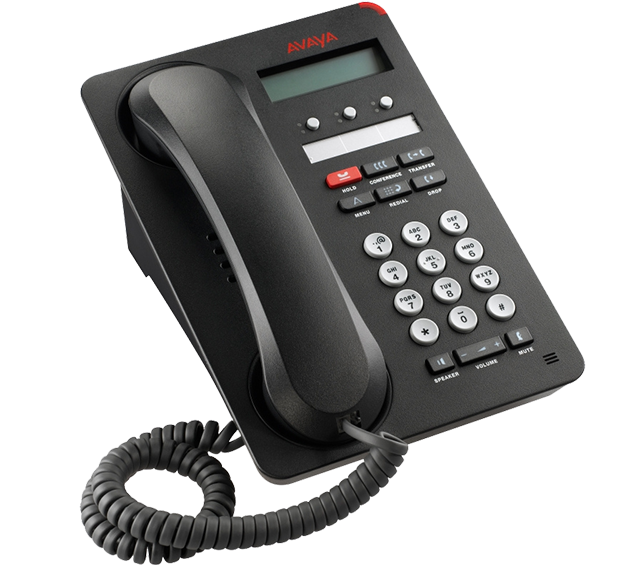 For the equivalent VoIP or IP version of this phone then please check out the new Avaya 1603 phone handset. The Avaya 1403 phone works with the Avaya IP 500 phone system and it's a great entry level phone and perfect to compliment the more advanced digital and IP phones. It's also more feature rich and easier to use than the Avaya 5402 handset it replaces. Avaya has gone back to a more traditional looking phone with this new 1400 series and the Avaya 1403 phone is very much like the popular LG Ericsson, Panasonic and others on the market. Now you get the looks you're familiar with, combined with the market leading system functionality. If you're looking to get a great system but still keep the costs down the Avaya 1403 phone is a smart addition to your solution. If you're looking to implement the awesome One-X on screen platform where you can do everything with the click of a mouse then you don't necessarily need the more expensive, feature rich models like the Avaya 1408 phone and Avaya 1416. You can do everything you need on screen from listening to voicemail, to answering and even transferring calls, accessing personal and company speed dials and even co-ordinating a conference call. If you're looking for more flex keys, or a phone for staff that are everyday users then check out the Avaya 1408, Avaya 1416, or the premium Avaya 9504 or Avaya 9508 phone. If you're looking for IP then check out the Avaya 1603, Avaya 1608 and Avaya 1616 models or the massive range of premium Avaya 9600 IP series. With all Avaya handset models you can mix and match from them all to create your own customised solution for your individual staff needs and budget. Contact us to arrange a no obligation Avaya demonstration and see firsthand how the sensational new Avaya IP Office 500 phone system can help transform your business.